For the past six years, this blog has been focused almost exclusively on healthcare reform. I still believe reforming our health care system is vitally important. However, it’s time to expand the focus and to start thinking about other topics. How should the operating costs be split among the four counties who own our regional jail? Many of the inmates in the jail suffer from mental illness and/or addiction to alcohol and drugs. How can the jail provide treatment that will keep these inmates from returning to jail? What should be done to attract more residents to live in Sherman County and to promote the viability of our cities? How can we promote the building of more middle-income housing? The construction of wind farms over the last decade has dramatically increased the County’s property tax revenue. The increased revenue may last only eight more years. How should this windfall be invested so as to provide the most benefits to the county over the long-run? Studies show that children who attend a high-quality pre-kindergarten do better both academically and economically later in life. Preschools are particularly important for children who come from disadvantaged backgrounds. How can pre-kindergarten be made available to all the children of Sherman County? I hope to discusses these topics in future blogs. Between 1970 and 2010, the U.S. adult obesity rate increased from 12% to 35% and obesity became a major public health problem. Excess weight is responsible for our epidemic of diabetes and is a major contributor to heart disease and many other health problems. While the rate of increase has slowed since 1990, waistlines have continued to expand. Many different and often contradictory theories have been advanced to explain this rapid increase in obesity starting in the mid-1970’s. As a result, no consensus exists about how to address the problem. I wish I could advocate a comprehensive program. The best I can do is offer a few suggestions based on my personal experience during the last four years. Like most people, I started slowly gaining weight after I turned 30 years old. By the time I was 60, I was just crossing over into the “overweight” range on the BMI charts (I’m 5’ 11’’ tall and was then 183 pounds). The conventional diet advice—“reduce calories, exercise more, and cut fat from your diet”—never worked for more than a few days. I ended up concluding that evolution has strongly programmed us to resist going hungry and that I was doomed to get slowly fatter. About five years ago, I read Gary Taubes’ book, Why We Get Fat and my views about diet and weight gain radically changed. Taubes makes a convincing case that weight gain is not due to eating too many calories or to exercising too little. It isn’t an energy balance problem. Weight gain is fundamentally a hormone problem caused by eating foods that simulate the production of too much insulin. Insulin is the hormone that signals the body to store fat. I decided to give Taubes’ recommendations a try. I eliminated sugar, grains and white potatoes from my diet and ate as much as I wanted of everything else—adding nuts for snacks and more vegetables. I committed to never being hungry. I’d briefly tried similar diets before and wasn’t surprised when I lost five pounds during the first week. After about a week on the diet, I noticed an unexpected result—my chronic upset stomach disappeared and getting through the day no longer required taking 10 Tums. This discovery provided an additional incentive to eliminate grains and may be why I’ve stayed on the diet. Over the following month, my weight continued to drop. I lost a total of 17 pounds and ended up back at the weight I was in college. Before I tried my new diet, I believed winning a million dollars in the lottery much more likely than ever getting back to my college weight. I started reading other books about diet’s effects on weight and health—including Taubes’ earlier magnum opus, Good Calories, Bad Calories. Taubes argues that the obesity epidemic started in the 1970’s as an unintended consequence of the campaign to convince the public to adopt a low-fat diet to prevent heart disease. The fat-cholesterol-heart disease link seemed plausible. Gooey fat is turned into gooey cholesterol by the body and this excess cholesterol plugs up the body’s plumbing. Unfortunately, the advice was never adequately tested and subsequent research has been unable to confirm the links. The food industry quickly responded by taking the fat out of processed food and substituting sugars—and the obesity epidemic was launched. Between 1970 and 2000, the amount of sugar in foods rose 25 percent. The public now believes with almost a religious fervor that fat damages their health. This belief is why many pages of Taubes’ books on obesity are devoted to examining the scientific links between fat and heart disease. I recently finished Nina Teicholz’s new book, The Big Fat Surprise. Most of the 300 pages are devoted to a critical re-examination of the scientific studies about fat. In the end, she comes to the same conclusion as Taubes—refined carbohydrates, not saturated fats, are the main cause of obesity and heart disease. 1. Progress won’t be made until our “public health experts” start advocating a clear new message. The previous advice—cut calories, exercise more, and eat a low-fat diet—doesn’t work. The best way (probably the only way) to attack obesity is to change the type of foods eaten by eliminating (or dramatically reducing) sugar and other refined carbohydrates. I’ve been surprised by how difficult this change seems to be for most people—especially since the diet doesn’t requires going hungry. Refined carbs evidently are very addictive and a month on the new diet may be required before the craving for refined carbs starts to abate. 2. We need to stimulate a renewed interest in cooking. Most processed foods are full of refined carbohydrates and a healthy diet requires more time in the kitchen chopping vegetables! 3. Exposure to farmers markets and local fruits and vegetable farms should be a part of the curriculum in every school. Students should learn to value fresh foods and know how to cook them. Reading the history of the diet wars over the last fifty years has led me to two conclusions. First, the advice we’ve received from our public health “experts” about what constitutes a healthy diet has been systematically wrong. It has caused great damage. Second, be very skeptical about everything you read about diet—including what I am writing in this blog. Testing theories in a statistically valid way is very difficult because researchers can’t control what people eat over a long enough period to measure the diet’s effects on health. Wrong theories and radically different policy advice can persist for decades. Whether the CCO’s succeed will ultimately be judged by how they perform in controlling costs. Providing better health care for Oregon’s Medicaid population is also an important goal. However, the CCO’s are an experiment whose primary purpose is to see if the growth rate of Medicaid spending can be reduced. Much of the CCO’s initial activity was focused elsewhere—on producing a “community health assessment” and a “community health improvement plan” (CHIP). The statutes establishing the CCO’s require both to be developed starting during the first year. This requirement absorbed most of the time of the Community Advisory Council (CAC) and the CCO’s staff during the important period when the CCO’s were first getting organized. The community health assessment is an important background document and the development of the CHIP stimulated many good ideas. The CCO’s need both. However, from the beginning, I’ve worried about diverting so much of the CCO’s attention away from where the main focus needs to be—reducing costs. The many hours spent developing the CHIP raised hopes, especially among the CAC members, that campaigns will soon be launched to address the problems they identified. Given the CCO’s current tight budgets, they will likely be disappointed. The CHIP’s focus is on programs promoting better lifestyle management and improved social and economic conditions—e.g., programs to reduce obesity and tobacco use and to increase the availability of family wage jobs. While these programs should improve health over the long run, the evidence indicates they are unlikely to pay for themselves by reducing Medicaid costs. What programs will produce the needed cost saving? I believe the workplace wellness programs run by large employers in the U.S. are a good place to look for answers. These programs have goals similar to the CHIP’s and have been in existence long enough to have a track record. I recently read a particularly interesting article about the PepsiCo workplace wellness program. Overall, the Pepsi program reduced costs. However, the lifestyle management parts of the program—weight management, nutrition management, fitness, stress management, and smoking cessation—didn’t reduce costs by enough to offset the money spent running them ($0.48 cost reduction for every dollar spent). The disease management part of the program, which focused on providing help to employees with ten chronic conditions, was much more successful. It reduced costs by $3.78 for every dollar invested and reduced hospital admissions by 29%. If you have access, the Health Affairs article on the Pepsi program is worth reading. You might also check here. My conclusion is that the CCO’s should make their initial investments in helping patients with chronic diseases to better manage their conditions. This conclusion is supported by another article that analyzes the effects of increasing deductibles and co-pays. Increasing deductibles and co-pays reduces total medical costs because the majority of the population is healthy and has a greater incentive to reduce unnecessary care. However, increasing co-pays raises costs for those with serious chronic conditions because they often benefit from more medical care. Until the CCO’s have succeeded in reducing the growth rate in costs, they should focus on their high-cost patients. The CCO’s face a major challenge because they don’t directly control the care provided to their Medicaid enrollees. Doctors and hospitals make the decisions about what care is delivered. To keep from going broke, the CCO must motivate these independent providers to reduce low-value, unnecessary care and increase prevention and other high-value care. The best way to motivate providers is to change incentives by eliminating fee-for-service payments and switching to capitated or bundled payments. Currently, all providers of medical care are still paid using fee-for-service and CCO’s are unlikely to be able to implement “alternative payment” methods because capitated payments require providers to assume risk that they are currently reluctant to accept. One solution may be to reorganize providers into larger integrated groups. However, Medicaid is not a large enough program to cause the needed changes. When the Coordinated Care Organizations (CCO’s) were organized two years ago, they fundamentally changed the way Oregon’s Medicaid program is financed and administered. The Oregon Health Authority (OHA) now provides each CCO with a fixed yearly amount of money—its “global budget.” In return, the OHA requires the CCO’s governing board—usually the local medical community partnering with an insurance company—to provide high quality medical care and keep costs from exceeding the CCO’s global budget. A CCO’s global budget is capitated; i.e., the amount of money the CCO receives each year depends only on the number of Medicaid recipients enrolled. The switch to capitated payments has two effects. First, it puts the CCO “at risk.” If the CCO isn’t able to deliver the required care without exceeding its fixed budget, it will go broke. Higher costs can no longer be passed on to someone else. The CCO can buy reinsurance for unexpected high costs in a particular year, but reinsurance won’t continue to supplement the global budget if losses continue. Second, because the growth rate in capitated payments is scheduled to decline, the CCO’s must quickly eliminate unnecessary, low value care and give greater emphasis to prevention and care coordination. Unless unnecessary care is reduced, financial pressure will build and a CCO’s only option will be to go back to the traditional method of balancing the Medicaid budget—cutting payments to providers. Further cuts in payments to providers will be seen as a major failure since low payments are already squeezing doctors and hospitals and limiting access. The CCO’s face a major challenge. They are responsible for providing health care, but have little direct control over the care that is actually provided. Few CCO’s own hospitals or directly employ doctors. They must contract with independent local providers for care. These doctors and hospitals—not the CCO—make the medical decisions for Medicaid patients. The CCO can influence the amount and type of care delivered only indirectly by changing incentives—mainly through the way doctors and hospitals are paid. So far, the CCO’s have made almost no progress in changing the way hospitals and doctors are paid. I recently realized that all the main providers hired by the CCO’s are still paid using fee-for-service. Primary care doctors are paid a capitated per member per month (PMPM) payment for office visits. However, they are still allowed to charge for the procedures they do and are not charged for referrals, so the only effect of the PMPM payments is to motivate primary care doctors to discourage unnecessary office visits. Specialists have part of their payments withheld, but can still increase their income by providing more care. Local hospitals and pharmacies continue to be paid fee-for-service. The incentives faced by the CCO’s are not being passed down to the providers who actually deliver care. For a CCO to succeed in the long run, providers must face the same incentives as the CCO faces and be paid in a similar way. Unfortunately, paying providers using capitated (or bundled) payments requires that providers assume financial risk. If payments don’t increase when a patient needs more care, the extra care reduces the provider’s income. So far, providers, especially small providers, have been reluctant to take on this new risk. The CCO Boards of Directors need to find answers to several important questions. How can providers be motivated to assume risk? Does the CCO have any power to force providers to assume risk? Currently, it seems that the insurance companies decide the method used to pay providers. What role does the CCO’s governing board have in making this key decision? I’m beginning to worry that the CCO’s may have a serious flaw. Many of the clinics and even hospitals that now provide care are too small to assume the risk that must be shouldered when fee-for-service payments are eliminated. Getting providers to accept the needed changes may be possible only when the CCO’s are able to contract with large integrated systems of providers that are big enough to assume risk. Forming these new organizations will be a challenge and the Medicaid population is probably too small to drive the needed reorganization. During the past year, I’ve attended the governing board meetings of both CCO’s that serve my area and am a member of my local Community Advisory Council (CAC). I continue to be impressed by the enthusiasm and commitment I see around me at these meetings. However, I’m worried. In its agreement with the Center for Medicare and Medicaid Services (CMS), Oregon committed to keeping the growth in per capita Medicaid costs below 4.4% during the 2013 fiscal year (July 2013 to June 2014) and below 3.4% during the 2014, 2015, and 2016 fiscal years. How difficult will achieving these targets be for the CCO’s? I haven’t been able to find a good analysis of this important question. 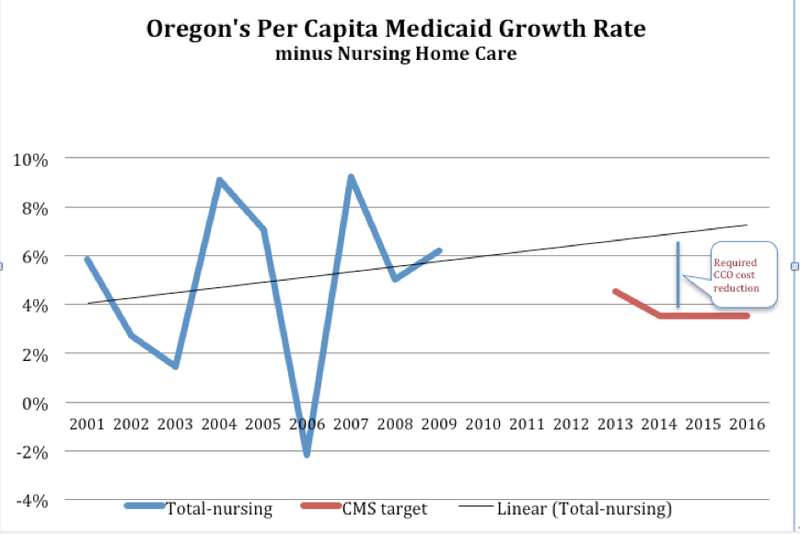 I did find data on Oregon’s per capita Medicaid spending up to 2009 on the Kaiser website and used the trend in this data to project what Medicaid spending would have been without the CCO’s. The gap between this projection and the targets in Oregon’s CMS agreement is an estimate of the amount of spending reduction the CCO must achieve. The CCO’s aren’t responsible for nursing home care. The growth rate in non-nursing home Medicaid spending is plotted in the chart below for the ten-year period from 2000 to 2009. The growth rate fluctuates widely during the period with a slightly increasing trend. The average growth rate between 2000 and 2009 is 4.6%. If spending continued to follow the trend line shown on the graph, per capita Medicaid spending would be 6.5% in 2014—over 2% higher than the CMS target. My conclusion from the chart is that the CCO’s will need to make significant changes to bring spending down to the CMS target. Past efforts to reduce Medicaid spending have focused mainly on cutting payments to providers and/or changing the rules so that qualifying for Medicaid is more difficult. Neither of these traditional approaches is available to the CCO’s. The Affordable Care Act significantly expands the Medicaid rolls. Payments to providers are already low and further cuts would make finding doctors to care for the new members difficult. What options do the CCO’s have left to reduce the growth in costs? I’ve been reading articles on this topic recently. Almost all these articles are discouraging (See, for example, here, here, and here. The one encouraging one I found is here). Since the CCO’s are so new, most of these articles focused on the CCO’s close cousins—the Medicaid Managed Care Organizations (MMC), the Accountable Care Organizations (ACO), and the HMO’s. Cutting payments to providers is the only change that worked consistently to reduce costs. I concluded that the CCO’s only options are to make the health care system more efficient by 1) providing better care to its high-cost patients and 2) changing the incentives of doctors and hospitals so they stop ordering low-value, unnecessary care. Better coordination of care for patients with “multiple treatable chronic conditions and very serious illness” does have a record of modestly reducing costs. Since these patients use a large percentage of the CCO’s budget, it makes sense to expand efforts to keep them healthy and out of the hospital. Hiring community health workers to assist high cost patients should be a good investment. In theory, eliminating fee-for-service payments and expanding the use of capitated payments should reduce costs by eliminating the ability of providers to increase their income by ordering low-value, unnecessary services. Unfortunately, the studies of the MMC’s and ACO’s have found little reduction in the quantity of low-value services ordered. This finding may be because the health care systems studied were not fully integrated and had major parts that still are paid fee-for-service. A mixed system reduces the incentives to coordinate care. Unfortunately, the CCO’s currently are dealing with a mixed system. Currently, only primary care and behavioral health services are paid using capitated per member per month (PMPM) contracts. Providers of non-emergency transport and dental services should be willing to transition to PMPM contracts since their risk of large unexpected costs is small and should be manageable. The CCO’s biggest and most uncertain expenses are paid to the hospitals, specialists, and pharmacies that treat the sickest members. Unfortunately, hospitals, specialists, and pharmacies are still paid mainly using fee-for-service. Since serious, expensive illnesses are difficult to predict, hospitals, specialists, and pharmacies have been reluctant to take on the additional risk of switching to capitated payments. The inability to extend capitated payments to these providers is a major problem for the CCO’s. It means the CCO itself must assume most of the risk for unexpected major illnesses. It also means that key subcontractors don’t face the incentives to reduce low-value care that a fixed budget provides. As large organizations, hospitals may have the financial resources to assume additional risk and may eventually be willing to accept capitated/bundled payments from the CCO’s. However, I don’t know how PMPM payments can be made to work for specialists and pharmacies, unless they are employed or owned by the local hospital. In early 2012, Oregon launched a new way of delivering Medicaid—the Coordinated Care Organizations (CCO’s). I’d been spending much of my free time during the previous two years reading books and articles about how to reduce the unsustainable growth in health care costs. When I read the description of the new CCO’s, I realized they incorporate many of the needed innovations. I was initially surprised that Medicaid would be at the vanguard of reforming our delivery system. Why not Medicare or private insurance companies? As I’ll explain below, I soon realized there’s a good reason why Medicaid is now taking the lead. Each CCO will receive a fixed number of dollars each year from the state and federal governments based on the number of Medicaid recipients living in the part of Oregon that the CCO serves. Local providers, e.g., doctors and hospitals, will form the CCO governing boards and assume responsibility for determining how to reorganize medical services so quality care is provided within this global budget. The Oregon Health Authority (the agency that administers Medicaid in Oregon) will monitor the CCO’s to ensure that quality standards are maintained, but otherwise will let local authorities innovate. Medicaid had already changed the way it pays primary care providers—going from fee-for-service to “managed care.” The CCO’s will expand managed care by putting all providers—including primary care doctors, hospitals, specialists, dentists, and mental health agencies—under one global budget. The rest of our health care system suffers from two fundamental problems. First, Medicare and private health insurance plans aren’t required to operate within a fixed budget. Medicare recipients are allowed open-ended access to all the medical services they desire and Medicare pays whatever this costs. Private insurance companies raise their premiums to offset cost increases. Workers ultimately pay for these premium increases through slower wage growth. Second, successful reforms must be lead and supported by medical professionals and we currently aren’t motivating them with the right incentives. The widespread use of fee-for-service payments has caused doctors and hospitals to focus on providing more services and often to ignore the effects of their actions on costs. I realized that Medicaid is the only part of our health care system facing a firm budget. With both state and federal budgets under severe pressure, the growth in Medicaid funding is likely to be flat or, at best, to increase slowly. The traditional approach of reducing Medicaid costs by cutting payments to providers has gone about as far as it can go. Further cuts will cause an unacceptable number of providers to stop seeing Medicaid patients. I believe the local medical community realizes all this. With a fixed budget, the only way providers will receive adequate compensation and have the resources to provided needed new services is to make the system more efficient. With the new CCO structure, providers have been given the power and a new motivation to make changes—so the limited resources go where they will provide the most benefit. Last April, I attended my first CCO meeting—a regional kick-off luncheon in Hood River featuring a panel of local providers and public health officials plus an inspirational talk by Dr. Bruce Goldberg, the Director of the Oregon Health Authority. I learned that the medical community in Wasco and Hood River Counties was in the process of forming the Columbia Gorge CCO (CGCCO) and I decided to attend their meetings over the next year. Their next step was selecting an insurance company to make payments and help with administration. They interviewed two insurance companies—PacificSource and ColumbiaPacific—and, after two close votes, PacificSource was selected. I suspected that county governments would be involved in the CCO’s since I’d seen Karen Joplin, a Hood River County Commissioner, on the panel in Hood River. I didn’t see anyone from Sherman County (where I live) at the initial meetings. Sherman County has a health clinic in Moro that provides primary care for the majority of Sherman County Medicaid patients. However, most of the specialist and hospital care is provided in The Dalles (the closest large town) and it seemed logical that Sherman County would be part of the CGCCO. I contacted the Sherman County Court and offered to report what I was learning at the CGCCO meetings. The Sherman County Court then appointed me as one of their two representatives on the group forming the CGCCO. Over the next several months, we spent almost all our time wrestling with how the governance structure should be set up—particularly how the three county governments would be involved. During these meetings, I was impressed with all the people I met, but especially with Dr. Kristen Dillon (the chair of the formation group), Dr. Judy Richardson, and Ellen Larson. Coco Yackley was very helpful in providing administrative support and keeping the group moving forward. I always saw a cooperative spirit at the meetings. I didn’t observe “turf battles”—even between the two rival hospitals. Before the last meeting of the formation group, my county decided to join the Eastern Oregon CCO rather than the CGCCO. The EOCCO includes most of the rest of Eastern Oregon, including all the counties to the east of Sherman County. The EOCCO promised to focus on the special problems of providing health care in sparsely populated rural counties. The Sherman County Court’s deliberation was more difficult because neither CCO had yet started making substantive decisions about planned changes. Sherman County’s decision left important questions unanswered. How will care for Sherman County Medicaid patients be coordinated and paid for when care is provided by providers located in a different CCO? I started attending CCO meetings for two reasons. First, I wanted to meet the health care leaders in my local area and observe how they and their organizations work together. I’m well on my way to accomplishing this goal. I very much appreciate the friendship and help I’ve received. My second objective is to learn how the governing board will tackle the huge problems it faces of controlling costs and better coordinating care. These issues are just starting to be addressed and the upcoming meetings should be even more interesting. I plan to continue attending. Keeping cost growth within a very slowly growing global budget will involve limiting payments to some of the organizations represented on the governing board. To paraphrase one of my favorite health care economists, “Every bit of waste and inefficiency in our healthcare system is someone’s current income.” From what I’ve seen over the past year, I’m confident the CGCCO’s governing board will be able to make the hard choices necessary to make the CCO a success. Last summer, I started using the popular blogging software, WordPress, to manage my website. I like it. Soon after Christmas, I tried to post a blog I’d written and discovered I could no longer access my “ad-min” dashboard. Blog entries are posted from the dashboard. I called the company that hosts my site. They told me that I had a “broken WorldPress log-in,” that they weren’t responsible, and that I was on my own in figuring out how to fix the problem. If I’d had a computer savvy teenager available, she probably could have quickly figured out the cause of my problem and got me going. I suspected my “broken log-in” had occurred during a WordPress software update. After two weeks of hoping the problem would go away and two weeks of learning ftp and about accessing SQL databases, I finally succeeded. It was a frustrating two weeks, but one good result is that I learned how to backup my website. Parts of the Internet world are still too complicated. I had no one to consult because I don’t know anyone in my area who uses WordPress. Being the first to adopt new technology often comes with frustration. We found this out several years ago when we installed a yield monitor on the combine and started applying fertilizer using a GPS-guided, variable rate controller. It took several years before problems that arose started looking familiar and we began to have confidence in our ability to diagnose and fix them. If you can see this post, I’m back in action. Will the Long-only Index Funds Continue to Dominate? As long as the long-only index funds maintain their dominate position in the futures market, we should see profitable opportunities to hedge our future crops. Will the funds’ dominance continue? Unfortunately, maybe not. Since the mid-2000’s, the growth of these funds has provided us with attractive new ways to market our wheat. At their peak, they held long contracts totaling almost 1.5 billion bushels in the Chicago soft red wheat futures market and currently hold long positions of around one billion bushels. Every new long contract must be matched by a new short contract. Hence, the funds’ huge new demand for long contracts required attracting many new short sellers. Most short contracts have been traditionally sold by farmers and other hedgers who are holding stocks of physical wheat. However, since the total soft red wheat crop averages less than 400 million bushels, the supply of short contracts from normal hedging didn’t come close to satisfying the funds’ demand. The funds had to attract new short sellers by bidding futures prices up relative to cash prices, causing an abnormally negative basis, and increasing the market carry. This made the hedging of all classes of wheat look more attractive. We took advantage by selling more of our future crops with base-price (hedge-to-arrive) contracts. Our coops earned higher profits by hedging and storing the wheat we sold to them and by delaying their sales to Portland exporters. I recently read a new study by Dwight Sanders and Scott Irwin (“A Reappraisal of Investing in Commodity Futures Markets,” Applied Economics Perspectives and Policy, Autumn 2012) that examines the long-run profitability of the commodity index funds. It concludes that their average long run returns have been essentially zero. Abstract Investments into commodity-linked products have grown considerably in recent years. Unlike investments in equities, commodity futures markets produce no earnings; the source of returns is thus unclear. This paper examines returns to static long-only U.S. commodity futures investments over five decades and finds that returns to individual futures markets are zero, and the returns to futures market portfolios depend critically on portfolio weighting schemes. Historical portfolio returns are not statistically different from zero and are driven by price episodes such as that of 1972-1974. In other periods, portfolio returns are zero or negative. Overall, the case for long-only investment in commodities may not be as strong as that implied in some studies (e.g., Gorton and Rouwenhorst, 2006a). If so, the growth in long-only commodity investments may naturally subside and ease the policy debate regarding speculative position limits. Low returns should eventually force the many pension funds and other investors who have put billions into these funds over the last decade to reconsider and shift their money to other assets. The long-only funds were originally sold as a way to diversify portfolios. Unfortunately for us, diversification by adding an investment that loses money on average isn’t a good strategy. While I was writing my last blog entry on wheat marketing, I started thinking back to how I marketed my other major asset—my wind rights. Are there similarities in the way I approach the marketing of my wheat and the way I marketed my wind rights? Before I try to answer this question, I’ll provide a little history. In the early 2000’s, several wind agents began roaming Sherman County. Their purpose was to convince us to sign over our wind rights, so the developer they worked for would have the right to construct wind turbines on our land. Signing a wind lease potentially involves huge benefits and costs and ties up the land for up to 50y ears. What surprised me then was how little advice and help landowners seemed to be seeking as they marketed their wind rights. Wind leases were almost never a topic of conversation when we gathered for lunch at the local café. Since I had no experience with wind leases, I paid $1,500 to a consultant to help prepare me for the negotiations and over $7,000 to have the lease reviewed by a Portland law firm. I (and the company I was negotiating with) learned a lot from these experts about the meaning of the different clauses in the lease. Wind leases have two features that discourage discussion. First, before negotiations start, the wind agent insists the landowner sign a “confidentiality agreement” that allows the details in the agreement to be discussed only with attorneys and immediate family. I’ve always worried that these “confidentiality agreements” put farmers at an unfair disadvantage. The land agent has a team of lawyers and wind-savvy colleagues with whom he can consult. The farmer often has difficulty finding experts to advise him during the negotiations and can quickly run up a big bill—years before seeing any significant income from the lease. The developers are able to cut farmers off from their best source of help—discussion with neighbors who have faced similar decisions. Second, the land agent must offer the same basic terms to everyone. He will quickly get irate calls if word leaks out that a neighbor has been allowed a higher royalty rate. Hence, unless a group of near-by farmers go together and negotiate as a block, an individual farmer has very limited bargaining power to change the basic terms of the lease. The farmer’s decision boils down to whether or not to sign the wind lease offered by the developer. I believe many of my neighbors signed wind leases without spending much money on experts or much time discussing their new opportunities with other landowners and, as I said above, this surprised me at the time. However, on reflection their actions make sense since they were unlikely to be able to get changes in the basic terms of the lease. I argued in the last post that spending time studying the supply and demand for wheat is unlikely to increase your ability to identify market highs. Similarly, spending time collecting information on wind leases is unlikely to get you better terms. I spent over $8,500 on wind experts. Did I gain anything? Again, there are some parallels to wheat marketing. My initial hiring of a consultant gave me a knowledgeable person with whom to discuss whether I wanted to proceed with the negotiations. It helped me feel more confident psychologically about acting. Hiring a lawyer to review the lease gave me a lot more knowledge about what I was signing. Did either of these experts improve my bottom line in the long run? That’s a question I can’t answer. Do We Need Help Marketing Our Wheat? When I look back over the last 25 years, I realize I’ve spent hundreds of hours discussing the wheat market with other farmers at bi-weekly marketing meetings and in the coffee shop. I’ve also spent several thousand dollars for my subscription to the White Wheat Report. I’ve regularly sought advice from the coop staff before making sales. I know I’ve enjoyed the social interactions, but has the additional information I learned about conditions in the world wheat markets improved my ability to identify good sales opportunities? In 1998, the Oregon Wheat Foundation hired Steve Buccola and Yoko Fuji to test WW marketing strategies. After lots of statistical analysis, they concluded we are wasting our time if we spend much effort on marketing. Selling at harvest every year does about as well as more complicated strategies. They recommended we focus on producing wheat. This is the result that most economists—who believe in the “efficient market” theory—expected. Farmers sell wheat based on the bids of Portland exporters. The exporters’ bids are set by experienced grain traders who have access to much more information than any farmer. If new information becomes available indicating prices are likely to rise or fall, exporters will act quickly to raise or lower their bids. Prices will reflect this new information before farmers become aware of it and no simple strategy should work to forecast prices. The only way to know the value of time spent studying wheat marketing and/or whether your advisors are providing useful recommendations is to do a test. Compare your actual net returns over the last ten years to the returns you would have received if you had used some simple strategy—say, selling on September 15th each year or selling once a week from harvest through November. One reason I was a fan of Larry Lev’s marketing approach was his willingness to test his strategies against selling the crop at harvest. He was able to show that his “harvest marketing strategy” increases returns by a small amount—about 5% over two decades (see here, here, and here). Unfortunately, the dramatic changes in the wheat market after 2007 have made Larry’s recommendations obsolete. I doubt the time and money I’ve spent on marketing has improved my ability to forecast wheat prices or to pick the top of the market. However, I believe I have benefited in two other ways. First and most important, attending market meetings often motivated me to stop procrastinating and make sales. Over the years, I’ve sold most of my wheat on Friday mornings right after a marketing meeting at which Chuck, Raleigh or Jeff outlined the reasons why prices could collapse. The most common marketing mistake is holding wheat unsold too long. Being forced to confront the downsides helped overcome my psychological bias toward excess optimism. Raleigh Curtis’s most important teachings were not about predicting prices. His main interest was in psychology and teaching us to act. He wanted us to be better decision makers. If a good price is available any time over the next three years, he wanted us to grab it. Second, marketing meetings helped me understand hedging and the dramatic way the long-only index funds have changed the wheat market since 2005. During my first thirty years of farming, marketing was simple. We sold the current crop on the cash market and had no good way to price future crops. Base-price contracts greatly expanded our marketing options and attending the meetings helped me understand how to use these new contracts. Finally, I recommend that you consider giving Kevin Duhling and his marketing service, KD Investors, a try. Kevin grew up on Wapinitia Flats near Maupin and still helps operate his family’s wheat farm. He always had a keen interest in marketing and wrote a marketing newsletter for several years before starting KD Investors. Kevin let me read his newsletter during the last couple of years and I can testify that he is very knowledgeable about futures, hedging, options, and the WW market. He also knows how farmers think and how to spur us into action when the time comes. His service costs 2¢ to 8¢ per bushel (depending on the level of personal attention you want) and might be money well spent. I doubt that Kevin can consistently forecast price movement. If he could, he’d be living very quietly in a mansion in Lake Oswego. However, I know he can help you in both the ways that marketing meetings helped me—by encouraging me to act and by helping me navigate the confusing world of long-only funds and base-price contract.